in our Parquet Flooring Cost guide you will find relevant information regarding the types of parquet flooring, the cost of installation and labor as well as up to 4 free contractor quotes. Parquet flooring is a type of hardwood flooring which is rapidly becoming a popular flooring option for homeowners. With its origin being associated with the richest Frenchmen and royal family back in 1600’s, parquet flooring is the kind of flooring you are likely to find in palatial residences and commercial properties. It has an elegant, stylish finish, a quality that has made this flooring option popular with designer magazines. Parquets tiles are commonly made of an oak material, but they are also available in walnut. Sometimes you can also find some parquets tiles made with exotic wood options such as mahogany, but this is rare due to the high costs involved. Parquet tiles are usually glued to mesh support of cloth, or a paper or plastic and then stitched to a thin plastic or metal sheath. Finished parquet tiles are usually treated with a sealer that is exceedingly durable. The sealer is applied through a machine on the entire surface of the parquet tile. A machine applied sealer lasts longer compared to the one applied on your own. Parquets can also be used in the form of wood slats which are nailed down to the subfloor during installation to form patterns. However, the slats are quite difficult to install, and you will find that parquets are rarely used in this form. Parquet flooring is one of the most elegant flooring mostly referred to as mosaic flooring. If you are looking for a stylish finish for your floor which leaves a unique decorative pattern in your entire room, parquet flooring should be your choice. This type of flooring is growing in popularity among homeowners for a host of good reasons. Here are the advantages of using parquet flooring. Parquet flooring is arguably one of the most stylish decorative flooring options. It is elegant, beautiful with a natural aesthetic appeal that gives your floor a unique personal character and beauty. Since parquet is made of wood, this kind of flooring gives your floor a warm, luxurious feel that makes a room cozy and inviting. Parquet flooring forms unique patterns that add a sophisticated look to your room. You can arrange the wood pieces to create a pattern that best defines your style and character. You can also cut the parquet pieces to form patterns and enhance the overall look of your room and uniquely set it apart. You can choose to have pieces that have varying colors and grains to create a decorative surface that complements the overall décor and style of your home. Parquet flooring has the unique classic beauty of wood that works perfectly for a formal set up. The pieces form unique patterns that bring out artistic designs and an elegant decorative effect. In addition, this type of flooring has a timeless appeal and weathers gracefully. It gives a warm ambiance with an elegant precision making it perfect for classic formal areas such as the dining, living room and foyers. Parquet flooring is one of easiest flooring toclean. In fact, all you need to do to keep the floor clean is to have a regular sweeping and cleaning routine. Wiping the floor with a damp cloth also does the trick. Additionally, parquet flooring does not trap odors, and it doesn’t hold stains easily making it simple to clean and hygienic. With this kind of flooring, you will not experience mites, bacteria, fleas, or even rotting incidences. Parquet flooring is durable and can last for many years even with everyday use. This flooring does not scratch easily. It will show minimal wear and tear years after installation. Parquet floors are made from hardwood, and the pieces are usually treated with a long-lasting sealer that is machine applied giving the flooring a long lifespan. This type of flooring is also strong and stable, and with proper care and maintenance, parquet flooring can last for 40 to 50 years without much damage. It is a sound investment which is a popular choice among homeowners, commercial and even formal setups. Parquet flooring, unlike other flooring options such as carpets and rugs, does not attract or host allergens, dirt or dust. It is the ideal flooring option for you and your loved ones especially for people with allergy issues. It also an excellent flooring choice for families with young children who are likely to develop allergy related issues. Since parquet flooring is easy to maintain clean, people with pets can expect to have fewer allergens as compared to a carpeted area. A simple wipe with a damp cloth on the smooth surface is enough to keep the floor free from any allergy-related agents. Parquet floors can be resurfaced easily if they happen to be neglected for a long period. Since they are pieces of solid wood, parquet flooring can be sanded just like any other hardwood flooring option. Resurfacing gives parquet flooring a new appealing look. In addition, the wood pieces used in making parquet flooring, have a thickness that allows this flooring option to be sanded and refinished several times before you start planning for a replacement. Parquet flooring is undeniably one of the most stylish and sophisticated flooring option in any setting. Its elegance and class make it stand out from other flooring options. This type of flooring is made of hardwood making it durable, stable and long-lasting. The parquet pieces form a unique wood grain and patterns that uniquely enhance and define a room and give it a special character. For this reason, a home or property installed with parquet flooring beautifully stands out with a special uniqueness and sophistication. The fresh setting and the unique design of parquet flooring cannot be compared to most of the flooring options, and this makes its value go higher than homes with forms of flooring. In addition, the floors can be sanded, re-stained and sealed to look as good as new. Parquet flooring is an ideal choice for those who love the timeless appeal of hardwood flooring. However, parquet flooring is made of 100% wood, and this means that just like any other wood option it requires regular maintenance. No matter how much you take care of this flooring, the tile pieces will require regular sealing, sanding, and polish to keep them looking good and appealing. Compared to hardwood planks, parquet flooring holds to the moist environment better. The wood pieces in the tiles are not prone to expansion as a result of high humidity conditions. But, as mentioned above, parquet flooring is mainly made of wood, so it is expected to warp, plump in and even mold if exposed to extremely wet or moist conditions. For example, if installed in a frequently used bathroom, or moist basement, parquet flooring will eventually show signs of moisture and water damage. Before installing parquet flooring, there are several factors that you need to consider that will influence the overall look and feel of your flooring. These are important factors that should not be overlooked. The first thing to consider when you are planning to install parquet flooring is to choose the type of wood for your floors. Parquet flooring is made from different species of wood, and each has different characteristics. The most common species of wood used for parquet flooring is oak. However, there other species that are also commonly used in parquet flooring. We will discuss a few characteristics of some of the commonly used wood species in parquet flooring. As mentioned, oak is one of the most commonly used species of wood in parquet flooring. Oak has a timeless elegance that complements the interior design of your home effortlessly. It has a deep golden brown color with a distinctive grain that flows elegantly to display the beauty of natural wood. Oak is arguably one of the strongest species of wood available. It has great elasticity and endurance that will see your floors last you a lifetime with minimal wear. It can withstand harsh weather conditions and its likely to be found worldwide. With oak, you can achieve any style you want from contemporary to classic. Beechwood has a robust beauty, with a fine grain that defines the natural feel of your floors. It is a strong and a hard wood option that will give you long-lasting floors. The beechwood has a distinctive warm pink hue. Maple has a natural luster with a silky display. It features a light color which includes cream white and a soft yellow. Maple wood is a resilient wood option considered to be very elastic. Ashwood features a wide diversity of colors from rich brown color to nearly white. It is one of most popularly used wood type for parquet flooring. It has a decorative grain that flows smoothly with parquet patterns. Ashwood is known for its strength, its hard and tough wood with good flexibility and elasticity. This is also another popular type of wood used for parquet flooring. It is hard, strong yet elastic wood option. It has a decorative grain with a smooth texture that makes floors look elegant and stylish. It features a golden brown and dark red color that give a room a warm atmosphere with an inviting feel. Walnut is a robust, tough wood that features a chocolate brown color with streaks of light and dark grains. With age, the American walnut achieves an elegant grain and intensifies its luster. This species of wood has a unique character brought by its imperfections making it particularly valuable and an expensive wood flooring option. Herringbone parquet flooring – this is one the most popularly used designs for parquet flooring. This design option has a broken zigzag pattern. Its created by laying the rectangular blocks in a staggered zigzag pattern at a 90-degree angle. This option creates a sophisticated look for your parquet floors and adds a unique elegance. It creates a beautiful flow of your flows and a stylish overall design in a room. Herringbone parquet design can also be created into a double herringbone design. It employs the same pattern only that in this case, the planks are laid in doubles to come up with much a thicker pattern and create a distinctive design. If installed properly, herringbone parquet flooring pattern can actually create an illusion of a bigger space, especially in small rooms. You can achieve this by using a laying the pattern in a diagonal design and make a small room appear bigger. This is what is referred to as diagonal herringbone pattern. To achieve the diagonal design, the patterns are laid in such a way that they go diagonally across the room instead of going parallel to the wall. Chevron parquet flooring – this type of parquet flooring design creates a pattern that resembles a repeated letter “V.” The planks in this pattern are normally cut at an angle and create an arrow point or a “V” shape when installed. Chevron parquet flooring design can also be installed diagonally or parallel to the wall just like the herringbone design. The choice will depend on the size of a room and your design preference. Chevron design requires a lot of work in cutting the planks to fit the required exact sizes. This makes it an expensive parquet design option as compared to herringbone design. Its installation is also costlier compared to herringbone parquet design. Chevron flooring requires a precise, perfect point which is a lot harder to achieve compared to setting the parquet planks at a 90-degree angle. However, the final pattern of chevron parquet flooring design is worth the price as it comes out exceptionally beautiful. It creates an extremely stable flooring with a rich traditional feel. Other parquet flooring patterns include basket weave pattern which can be laid diagonally or parallel to the wall depending on your design preferences. Another parquet design option is the brick pattern. Just as the name suggests, the brick pattern resembles the traditional brickwork. This pattern combines different shades of planks and integrates them to create a beautiful pattern with several varieties of wood shades. The installation of parquet flooring can be time-consuming and difficult. It would be a lot easier to install parquet flooring using parquet tiles which are a lot easier to install. The parquet flooring tiles also come in various designs that allow you to achieve a preferred pattern easily. Even though the tiles are more expensive compared to herringbone boards, you save a lot of time and money in the installation process. In addition to the cost factors, you will be able to achieve priceless final flooring display with parquet flooring tiles. Just like any other regular hardwood floor, parquet flooring can be found in three different grades which include prime, select and rustic. These three different grades give your flooring a unique character, and none can be said to be better than the other. The choice of parquet wood grade will boil down to your preferences and the character you want your floors to achieve. Prime grade – this parquet wood grade features a uniform appearance and has very few knots or sapwood. It has a consistent color that gives your floors a top-end kind of look. It is sharp, elegant, extremely clean with a streamlined finish that leaves floors looking smooth and sleek. The prime grade parquet flooring will guarantee you a top-notch look for your home especially if used in the entire house to achieve a sleek uniform appearance. Select grade – this parquet wood grade has a few large knots and a bit of color inconsistency. It comes off as a highly stylish wood grade option and still has a uniform and smooth appearance. If you are looking to achieve something close to prime grade but at a lower cost, the select grade should be your ideal choice. Rustic grade – this grade option gives off the most natural look of wood. It has different chunky knots and can sometimes feature dramatic color variations. If created with a bit of imagination and creativity, the rustic grade can offer a fabulous appearance for your flooring. The knots and the color variation can add a unique character and charm to your room. It adds a style and great furnished feel with a decorative effect. Any grade option will give your floors a unique special character. The different grains in each grade will impact on the visual aspect of your floors, and each will give your flooring an elegant lively effect. As you plan to install parquet flooring, consider the grade of parquet wood for your flooring and choose accordingly. What type of finish do you want your parquet flooring to have after installation? Would you prefer a natural finish or hard finish? You can opt to have matt parquet floors or oiled parquet floors. Both options are made of wood; the only difference is the surface finish. The choice of parquet flooring surface finish will depend on the kind of wear and tear that your parquet flooring will be exposed to. Surface finish usually acts as a protection to the flooring against external elements and preserves the natural radiance of your parquet flooring. A matte finish for your parquet floors makes your floor durable and particularly easy to clean. Natural oil surface oil finish creates a natural look for your parquet flooring, and it’s also easy to clean and maintain. The cost of installing parquet flooring will depend on several factors which include the surface area, the grade of the parquet wood, species of parquet wood, labor rate, initial site preparation, parquet flooring pattern design, and any other special requirement. The cost will also depend on the state of the subfloor if it needs to be repaired or removed altogether, the cost of removing and disposing of the old existing floor, and the cost of moving furniture. If you are professionally installing parquet flooring for an average home of about 2500 square feet using oak hardwood parquet flooring, expect to spend about $14,790 or an average cost of $18,980 using walnut hardwood parquet flooring. If you plan to DIY, expect to spend about $9,771 for a 2500 square feet home using oak hardwood parquet flooring. If you are installing a new subfloor with new floor joists, a carpenter will charge you an average cost of about $22 to $35 per hour. If the contractor has to remove the old flooring and the underlayment, you should expect to spend about $0.01 per square foot. Wood species: this is one of the main factors that will influence the overall cost of installing parquet floors. Planks of different species of wood come with different price tags, and some are a more expensive than others. For example, parquet planks made of oak are generally cheaper than exotic wood such as mahogany or tropical hardwoods. The choice of wood species will entirely depend on your budget and taste. The thickness of the parquet flooring planks: the cost of parquet planks will also depend on the thickness of the planks. The thicker the planks, the more they will cost per square meter. Thick and long parquet planks create beautiful floors especially in large spaces such as spacious living room, mansions, and even offices. However, wide and thick parquet flooring planks come from large trees hence a higher production cost. The cost will boil down to the final price of the parquet planks and installation. The advantage of using thick parquet flooring planks is that the floors can actually be sanded and finished several times, even up to 10 times without the need for replacement. You can enjoy your parquet flooring for a longer time. The finishing: as mentioned earlier, one of the factors to consider when planning to install parquet flooring is surface finish. You can finish your parquet flooring with lacquer, or with oils or you can opt to smoke the wooden flooring. Finishing comes at an extra cost so as you plan the installation of parquet flooring; you should factor in the type of finish you want and its cost. Finishing your parquet flooring is essential for it offers protection on the coating otherwise the wood will get spoiled by external elements such as spilled liquids and dirt. Parquet floors generally require more work to finish them, and the cost of refining such floors will be higher than that of refinishing normal hardwood floors. You should expect to spend anywhere between $6.75 to $10 per square foot on refinishing parquet flooring. Patterns and craftsmanship needed: the type of parquet flooring design patterns you want will also influence the cost of installing parquet floors. Patterns such as herringbone, chevron, and other sophisticated patterns will require an experienced and skilled parquet layer to maneuver and deliver the required craftsmanship. The choice of patterns will determine the amount of time taken to lay the design of your preference which will affect the cost of labor and the number of parquet planks or tile needed to achieve the desired pattern. Underfloor: the state of your underfloor can influence the overall cost of installing parquet flooring. In some situation, the underfloor may require some work to improve its quality before installing parquet flooring planks. The subfloor has to be leveled flat, hard and permanently dry before installing parquet flooring. Such costs are not usually included in the initial quote of installing parquet flooring, and they will be considered as an extra cost. Glue cost and skirting: you will require a considerable amount of glue to glue down the parquet planks or tiles, and so you have to consider the extra cost of purchasing glue. You also need to factor in the cost of solid skirting which will include assembling. Parquet flooring installation can be a suitable project for a DIY enthusiast. However, if you plan to DIY, you should consider using prefinished parquet tiles to make the installation manageable and easier. You can actually achieve the complex designs such as herringbone patterns using parquet tiles which are available in dark and light oak. The oak parquet flooring tiles create stable and durable floors with an appeal of real wood. 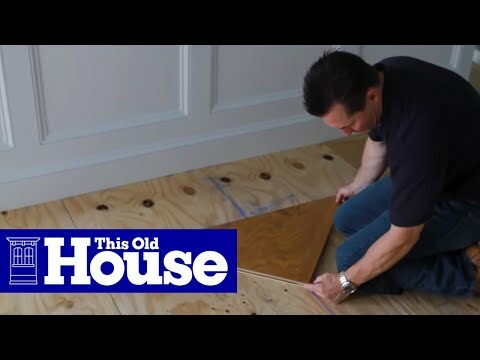 DIY parquet flooring installation will save you a lot of money, almost half of the cost you would have used if you hired a professional parquet flooring layer. For example, a flooring contractor will charge you about $1,110 for installation of prefinished oak parquet flooring in a room of about 10ftx12ft where the subfloor is level and in good condition. This cost will include labor and materials to be used in the installation. If you choose to DIY, you will save almost half of the above cost. For the same surface area, you will only spend on the parquet flooring tiles and adhesive glue which will come at an average cost of $580. However, if you plan to install parquet flooring by yourself, do not underestimate the amount of time required and preparation work which includes removing the existing flooring materials. As you plan, you should budget for time and extra money that might be needed to replace the existing subfloor if its condition is wanting. For a room of about 10ftx12ft, expect to spend about two days on installation. This will include preparing the subfloor, getting rid of the floor trim, laying the parquet flooring tiles and then cutting the tiles and fitting them. Start by cleaning the subfloor. This involves removing paint, adhesives, sealant, wax, and debris. The subfloor should be permanently dry before you start laying parquet flooring tiles. If your subfloor looks uneven, you need to level it using a belt sander. If there are any lower spots, you should fil them using a leveling compound. If some areas of the subfloor are damaged, do a replacement to ensure the floor is smooth and level. Once the subfloor is level and smooth, tighten any loose areas to make sure its firm. For an easier installation, you need to mark the center of each wall. Use a marker to draw lines and connect them with the opposite walls. Make sure that lines are in line with walls and evenly spaced out. This will help you lay the blocks and keep them straight. Start laying the parquet tiles on the floor right from the point where the lines intersect at the center as you move out in line with each line towards the walls. As you lay the tiles on the lines, do not apply the adhesive yet. After laying parquet tiles, you can now start applying adhesive on the subfloor. You can use a notched trowel to apply adhesive on the area where the parquet tiles will be laid. Lay the first tile and make its aligned with the lines you drew. Keep adding adhesive as you lay the parquet tiles on the subfloor. Getting it right with the first tile is very important. It sets the pace for the subsequent tiles. Ensure that there are no spaces or cracks where the tiles meet as this will affect the other tiles so take your time to make everything perfect. After laying the tiles, align the flooring and tap each tile with a rubber mallet to make sure each of the tiles is in place. Keep doing this until all the tiles have been laid and aligned but leave the last row of parquet tiles. Measure the tiles for the last row and cut the tiles to fit in the space left and then lay the tiles. Using a floor roller, set the parquet flooring to ensure that its firm and in place. The floor roller should be 150 pounds in weight to set the floor appropriately. This should be done a few hours after the installation process. After installing the parquet flooring, you can finish the surface. You can opt for oils based finish, lacquer or go for a matte finish. The choice will depend on your preference and how you want the floors to look after installation. Parquet flooring is a flooring an investment that can add value to your home immensely. You need to protect your parquet flooring to maintain their beauty and lifespan. Here are a few points that will help you take care of your parquet flooring. For daily maintenance and care, mop your floors with a dry wool mop or a microfiber to get rid of dust and particles. In case of wet spills, wipe them quickly and promptly using an absorbent cloth or paper towels. If the spills are sticky and leave stains, use a damp towel or washcloth to wipe them off. Vacuum your parquet flooring regularly or schedule weekly vacuuming. The floor needs to maintain its luster and brightness. To achieve this, you should clean the parquet flooring using cleaning products specifically designed for wood floors at least once a month. When moping your parquet floors, avoid using a steam mop. The heat and moisture in a steam mop can cause damages to the finish and eventually the wood grain might start to swell. Avoid using a floor wax or polishing products designed other flooring options such as ceramic tiles or vinyl. Such products might end up damaging the parquet flooring surface finish. Lay rugs in areas exposed to high foot traffic to protect your parquet flooring finish. You can also use stick-on silicone protectors under your furniture’s legs to protect your floors from scratches and dents. Dusting products used on wood furniture can actually make your parquet floors slippery which is dangerous and so, they should be avoided. Parquet flooring consists of blocks of hardwood or solid wood pieces integrated together to form beautiful intricate patterns on the floor. It is a timeless choice of flooring option that offers a warm ambiance and a classic appeal to a room. Parquet flooring is easy to maintain, its non-allergic can easily be refinished, and on top of it all, it’s stylish and aesthetically appealing. Parquet flooring is commonly made using oak material and other species of wood including exotic ones like mahogany. Each wood species and grade offers your flooring a unique characteristic and personality. This type of flooring comes with various design patterns which include herringbone and chevron. The choice of flooring patterns will depend on your preference and taste. The cost of installing parquet floors will depend on surface area, grade of the wood, wood species, labor charges and preparation requirement. You can cut the cost of installation by opting to use parquet flooring tiles which are DIY-friendly and require no nails to lay them on the subfloor. Parquet flooring is an ideal flooring choice for residential and formal setups. It brings a warm appeal and gives a room a feel of real wood. With proper care and maintenance, parquet flooring can last for a long time and maintain their luster and beauty.